Whenever I'm bored or procrastinating I tend to browse recipes. I have several apps on my iPhone in addition to numerous cookbooks I like to peruse, and then of course there's the infinite Internet. I'm terrible at making decisions and hate to go grocery shopping, so I usually pick recipes that call for ingredients I already have on hand and, in most cases, need to go ahead a use because they've been around for a while. 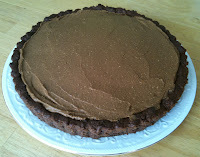 I recently made a dairy-free chocolate mousse I saw on the recipes section of the Whole Foods website. Mine didn't come out nearly as smooth and creamy as their picture, but it still tastes good even if the texture is off. The trouble was that the recipe made quite a lot, and I couldn't help thinking that it would be better as a filling for something rather than just eaten on its own. I figured I'd try pairing it with the same tart crust I used to make those Chocolate Raspberry Truffle Tarts last year, except I didn't have enough pecans, and I couldn't be bothered to toast them. Instead I used half pecans and half walnuts, but then I think I processed the crust too much because it was pretty moist and didn't seem like it would go all that well with the mousse. I was really wanting a cookie-type crust, not a thicker and denser version of the mousse, so after I pressed the crust mixture into a loose-bottom tart pan I baked it in the oven to try and firm it up and dry it out. This made it more like a dense brownie. Not exactly what I envisioned, but I had to go with it. Cover cashews and dates in with hot water and soak for 2 hours to soften. Drain well. Place cashews, dates, pumpkin, and coconut milk in food processor bowl and process until smooth. Add cocoa powder and vanilla, and process until smooth and mousse-like, adding a bit more coconut milk if needed. Chill at least 1 hour or until ready to serve. As mentioned, mine didn't quite make it to the smooth and mousse-like stage no matter how long I processed it, so I eventually gave up and just accepted that my would have some coarse bits of cashew in it. I upped the cocoa powder to 3 tablespoons this time, while decreasing the salt by a bit and only adding 1 tsp of vanilla instead of 2. What the heck, since this whole ensemble was pretty much an experiment anyway. Process the nuts and salt in food processor until they look like coarse crumbs. Add the cocoa powder, dates, and vanilla then process until well combined. Press the mixture into the bottom and up the sides of a loose-bottom tart pan. I think this one is 9 inches, but I could've used an 11-inch tart pan for a thinner crust and it may have turned out better. I then baked it in a 350-degree oven for about 15 minutes. Cool completely before adding the chocolate mousse filling, then chill in the refrigerator until ready to serve. Garnish as desired with, well, anything you want really. I melted 2 bars of white chocolate (Lindt is good stuff) then stirred in some coconut oil so it wouldn't set up quite so firm, and allowed it to cool until it was thick enough to pipe some oversized rosettes around the tart's top edge. I wouldn't call this creation a total failure, as it's certainly edible, but the crust fell apart as soon as I sliced into it, which was disappointing, and the mousse not being totally smooth really bugs me. I wish I had a slice of that right now!It looks delicious.I came across your site from the foodieblogroll and I'd love to guide Foodista readers to your site. I hope you could add this chocolate mousse widget at the end of this post so we could add you in our list of food bloggers who blogged about chocolate mousse,Thanks! this looks so yummy.. im going to have to try this one.. thank so much for sharing..